How can I search the Faculty Bulletins? To search the collection online, go the Search page and enter the word(s) or phrase (such as author, title, subject, and date) to search all of the pages inside the newspapers for your term(s). The results will display the records of the newspaper(s) with your terms. What is OCR and how does it affect my searching capability? OCR (Optical Character Recognition) is the technology by which digital images are transferred into a searchable text document. 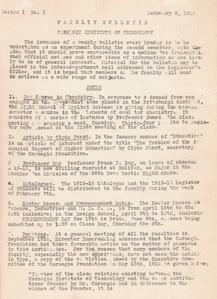 OCR works best with originals or very clear copies of documents, books, journals, newspapers, etc, with standard type fonts such as Times, New Roman. OCR has several limitations such as the inability to recognize stylized or usual fonts and bold, italicized, and underlined text. It also does not recognize items such as forms, fuzzy or blurry photocopies, mathematical formulas, and handwritten text. 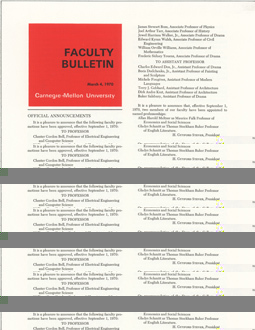 Since the Faculty Bulletins use stylized fonts, it is inevitable that the OCR software will occasionally fail to convert certain text and document types; therefore, affecting and limiting the user’s searching capabilities. Who should I contact for technical assistance? How do I cite the collection? 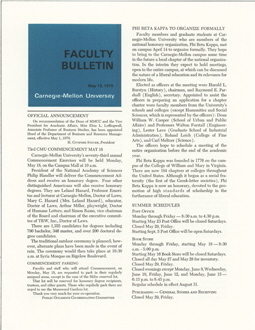 [Faculty Bulletins], Carnegie Mellon University Libraries, Pittsburgh, Pennsylvania. Documents that have been scanned and made available online may be cited by their persistent URL. Are there other collections in the digital collections that might be of interest to me?